On August 6, 2000, firefighter John McColgan snapped a digital photo that instantly became one of the most recognized environmental photos of all time. McColgan was standing on a bridge over the East Fork of the Bitterroot River near Sula, Montana. 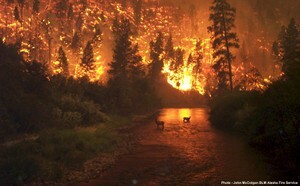 He photographed two elk that had taken refuge in the river while a towering forest fire burned behind them. What isn’t seen in the photograph are the other animals, including deer and bighorn sheep, also taking desperate sanctuary in the river while their forest home burned. For the past several summers, huge wildfires have blackened large chunks of Idaho. Wildlife biologists and ecologists generally recognize the virtues of wildfire in creating and maintaining habitat for wildlife and for sustaining ecosystem functions in the long-term. However, in the short-term, fire can be the devil’s tool. For instance, if you are a slow moving or young animal, getting toasted by a fire is a real possibility. Imagine a salamander or a bear cub trying to outrun an advancing fire. They might not even realize the danger before escape is impossible. Even birds that can usually out-fly a fire may lose nests still full of youngsters. A large fire generates its own wind which helps it race through the forest or rangeland with amazing speed. The fire may lance flames through the crowns of the trees or rocket embers far out in front that ignite to block escape routes and trap even large mobile animals in the inferno. And what if you are an animal lucky enough to escape the fire? In the short-term, the same fire-induced habitat changes that may ultimately create a wildlife nirvana can leave you without a home to return to. It has taken the forests of Yellowstone 25 years to produce 20 foot tall trees on areas burned in the fires of 1988. If you are a creature of the mature forest, returning home may take generations. Species that depend upon seasonal habitats may get a nasty surprise the first year after a fire. What does a mule deer do when it migrates to winter range only to find a blackened sea of ash instead of sagebrush, bitterbrush and grass? They can’t wait 20-50 years for recovery. In pre-settlement days, these deer might have shifted to an unburned area, but those days are long gone. Winter range is a scarce commodity and the mule deer, elk, pronghorn antelope and bighorn sheep that depend upon it rarely have other options when it is damaged. Their populations will shrink to fit the available habitat, growing only as habitat recovers. It is a similar pattern for sage-grouse. Sagebrush is their habitat and it didn’t evolve with fire. When fire rips through sagebrush, it is gone for a long time. Sagebrush habitat is declining rapidly and when another 100,000 acres burn, it creates a critical short-term loss of breeding, nesting and wintering areas, even if the habitat will eventually recover. While long-term benefits from fire are real, McColgan’s dramatic image demonstrates that short-term tragedies occur too. There are many places where wild animals are going to need our help to hasten restoration of key habitats. This photograph, taken by firefighter John McColgan on August 6, 2000, illustrates the short-term predicaments that wildlife can face during and after a wildfire.